"My family loves this cake. 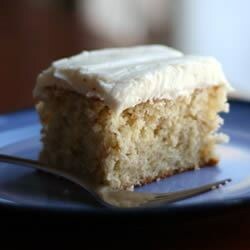 Frost with a cream cheese frosting with one ripe banana added and confectioners' sugar sprinkled over the top." i followed this recipe exactly how the recipe says. but my cake came out very flat and was literally 3/4 inch thick. does anybody know what is wrong?